The Los Angeles Lakers were trailing the Los Angeles Clippers by just two points at the end of the first quarter Thursday night following a run of 7-2. However, the “other team” in LA decided playtime had ended. What followed was history, albeit the wrong type if you are a Lakers player, coach or fan. Once the other three quarters were played, the Lakers were completely embarrassed on national television from a 48-point rout, which was their worst loss in the history of the franchise. The score 142-94 was shocking to even the most diehard Lakers fans. Viewers watching on television saw Mitch Kupchak the general manager of the Lakers with a disgruntled look on his face that went around the social media sites on the Internet. 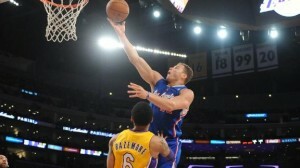 The Clippers ran the Lakers into the ground, threw lob after lob and maligned the defense of the Lakers at will. The Lakers were slower even though they were smaller. They were outraced on the fast break 34-23. The margin the Clippers had in a rebounding advantage was 64-33. The Clippers put up 44 points during just the second quarter, while the Lakers could manage just 40 for the entire first two quarters. Pau Gasol scored 21 points for the Lakers and said after the game that the Lakers were lacking in fight and they played terrible overall. The previous largest loss in franchise history for the Lakers was a 129-83 defeat at the hands of the Portland Trail Blazers in 1995. The win was the largest margin by the Clippers in their franchise history. Over the past two games head to head, the Clippers have outscored the Lakers by 84 points. The Lakers surprisingly defeated the Clippers to open the season, but since then, the Clippers have a 265-181 advantage in points scored over the past two games. The two will meet again in one month. This time the Clippers will be the home team in the same Staples Center. With Kupchak’s disgruntled look plastered across social media, there are rumors that the team could be thinking of making a coaching change, but no comments was given by a team spokesperson when the question was asked.